We inventory a large variety of ASTM A554 stainless steel square tube in various lengths and custom specifications. All of our stainless steel square tubing meets and exceeds the industry's strict specifications, so you know you are receiving the highest-quality square tube available today. Stainless steel square tubing resists corrosion, provides additional mechanical properties when required and permits an upgraded stainless steel architectural appearance. Sizes: 1/2" x 1/2" - 12" x 12"
Wall Thicknesses: .035" - .500"
We supply high-quality square stainless steel tube for large structural steel construction. Our stainless steel square tube not only provides high strength and corrosion resistance for the harshest environments, but also can be added for architectural and aesthetic purposes. For an overview of product offerings view our stainless steel products line card. Our structural specialists can help you select the right stainless steel square tube size and other alloy products for your construction needs. 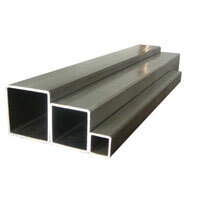 We supply a variety of stainless square and rectangular tube conforming to ASTM A554. View the standard specifications chart. Our products come in a variety of stainless steel grades. To help you select the products that are right for your construction we include this stainless steel grades chart. Identify the different structural, tube, pipe and other products we offer and the stainless steel square tubing and other product merchandise in our inventory. We've included specification charts and product illustrations for easy identification. Stainless steel square tube and rectangular tube is commonly referred to as tube steel or structural tubing. These are also referenced as a hollow structural section or HSS for short. Used for structural purposes, square tube, rectangular tube, I beams, etc., can be purchased in many different types of steel and alloys. Manufacturing of square tube is the same as the manufacturing process of pipe but the product goes through a series of shaping stands, meeting its final square specifications.